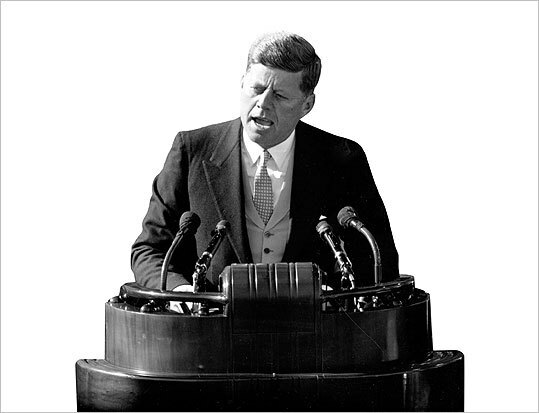 What makes a great presidential speech? Ten top moments from Ted Sorensen and John F. Kennedy. Ted Sorensen, who died early last week, was legendary among all of us in the speechwriting fraternity for the extraordinary body of work he crafted with President John F. Kennedy. Even the Republicans pilfered from him, and inside the Clinton White House, he represented a gold standard that we constantly strove to reach, with imperfect results (it’s harder than it looks). There is a great deal to be said about why those speeches were so good. Obviously, much of the credit belongs to the person delivering the speech, and Ted Sorensen was blessed with a partner of rare ability. But he brought his own great abilities, which dovetailed perfectly with those of President Kennedy. He was lean in every sense; not a single word was wasted in those taut, muscular orations. Famously, Sorensen consulted the great speeches of American history before writing the inaugural address, and discovered that Lincoln’s Gettysburg Address had very few polysyllabic words. The result was those thrilling two syllables, “ask not!” (the “ask” stretched dramatically into Bostonese), more insisting than asking. They were essential to set up the rest of the famous sentence. Not just the “ask not,” but the important pause that came after, with an index finger jabbing the frosty air. That was political theater of the highest order. Sorensen was gifted in many other ways; his phenomenal work ethic, his lightning speed, his mordant wit. He was mischievous, and with his perfect crop of hair, retained an air of Kennedy-esque boyishness well into senescence. All of those qualities gave spice to the speeches — unlike so much of Washington oratory, every utterance contained the possibility of a surprise; an unusual allusion; a bracing witticism; and always, a summons to action. In Sorensen’s memoir, “Counselor,” he wrote, “I approached each speech draft as if it might someday appear under Kennedy’s name in a collection of the world’s great speeches.” That is setting the bar pretty high — but consider the results. This top ten list of speeches by John F. Kennedy and Ted Sorensen does not include what may have been the greatest contribution Sorensen made to history — he drafted the letter to Nikita Khrushchev that helped to resolve the Cuban Missile Crisis. It also does not include some memorable speeches drafted by other pens within Kennedy’s inner circle — for example, the exquisite address given at Amherst College in 1963, praising poetry, drafted by Arthur Schlesinger Jr. But what a list, all the same. 2. Inaugural Address, January 20, 1961. This speech, of course, was the template for all that followed. It pulsed with energy and determination; it contained a real agenda for the future; and it energized a generation that had been quiescent, mainly because it had never been asked to do anything. It contained both power and poetry, including rhymes (“Let every nation know...that we shall oppose any foe”). Despite a rare Sorensen clunker (the mixed metaphor, “if a beach-head of cooperation may push back the jungle of suspicion...”), this was a speech for all time. 4. Berlin Speech, June 26, 1963. No American president has ever looked more attractive to the rest of the world than President Kennedy did on the day he went into West Berlin, encircled and nearly walled off by communism, and delivered this short, exciting, and utterly winning address. It contained memorable soundbites (“Ich bin ein Berliner”), surprising flashes of humor (JFK thanked his interpreter for translating his German into German), and the drama of a president perfectly matched to his time. 7. Speech on Algeria, July 2, 1957. This speech, given by then-Senator Kennedy, proclaimed his independence from party orthodoxies on the right and left, and his willingness to think anew about the Cold War and the role of the developing world within it. It infuriated Democratic Cold Warriors like Dean Acheson, but with the advantage of hindsight, we can see that it was not only visionary, but correct. Sorensen called it “one of the most carefully researched speeches he ever gave,” and it had to be, for it questioned nearly all of the assumptions guiding US foreign policy. 10. Farewell to Massachusetts, Boston, January 9, 1961. This call to integrity was delivered inside a legislative chamber (the General Court) that has not always lived up to those standards, but has stood the test of time. Inspired by President Lincoln’s farewell to Springfield, the speech insisted that it was not a farewell, but like Lincoln’s, it was all the same. It went deeply into the original errand that brought settlers to the Bay Colony, citing John Winthrop’s City on a Hill passage, correctly for once (“We shall be as a city on a hill — the eyes of all people are upon us”). That phrase has been borrowed by many others, notably Ronald Reagan (who added the un-Kennedyesque adjective “shining”), but never more effectively. Along with Daniel Webster’s Reply to Hayne, and his Bunker Hill Address, it is the finest speech ever given about this state by an elected official. Ted Widmer served in the Clinton White House from 1997 to 2001, first as a speechwriter, then as a senior adviser. He directs the John Carter Brown Library at Brown University and is a senior research fellow with the New America Foundation.